Water leak can cause large economic loss. Protect your home from potential water damage by keeping the Leak Alert anywhere water leak is a potential danger. You can place it near plumbing, sinks, aquariums, sump pumps, refrigerators, dishwashers, toilets, basements, washing machines, water heaters, and garages. Although the unit depletes battery only when alarm sounds, we recommend that you replace the battery and test the unit at least once a year for proper operation. Alarm will also sound when battery gets low. In any situation, the height of water surface must not be more that the height of the back cover, otherwise water will get into the unit and cause damage. Make sure that no water will get into the unit to avoid damage. Low battery indication the unit sounds when there is no leak detected. Refer to Figure 2, use the right hand thumb to press the back cover, meanwhile use the left hand thumb to remove the front cover carefully. Connect a 9V battery (6F22) to the battery cable. Rejoin the front and back covers. Wet your finger and touch the two steel wires of the sensor. A loud alarm will sound if the unit is good. Dry the two steel wires of the sensor to stop the alarm. 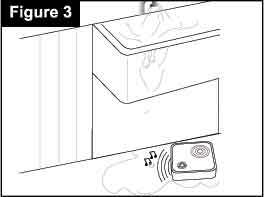 Refer to Figure 3, place the unit in a desired position with its buzzer hole facing up, otherwise water may get into the unit. 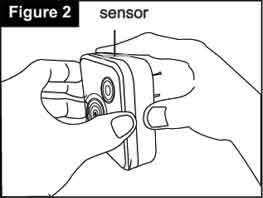 When water leak is detected by the sensor, the unit will give alarm. 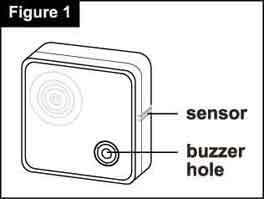 A probable cause is that the buzzer hole is not up and the sensor can not touch water. Make sure the placement is correct. Another probable cause is that the battery is flat, you should use a new battery. The unit does not give alarm when touching water. A probable cause is that the battery is low, you should replace it with a new one of the same type. Another probable cause is that you are using the unit on a conductive surface. You can place a piece of thin paper or plastic between the unit and metal surface to solve the problem. If you at some point intend to dispose of this article, then please keep in mind that many of its components consist of valuable materials, which can be recycled. Please do not discharge it in the garbage bin, but check with your local council for recycling facilities in your area.